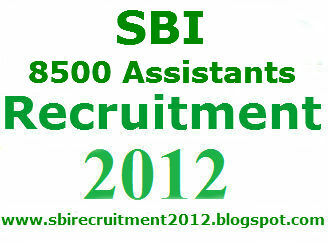 Number of Vacancies: 8500 (Gen-3145, SC-2069, ST- 1337, OBC- 1949).The vacancies listed there also includes those vacancies that were advertised in the previous SBI Clerical Advt for SC/ST/OBC. Probation Period: 6 months.Probation period is the time period during which the performance of newly appointed Candidates will be evaluated.If the Performance of candidates is satisfactory after the Probation period then HE/SHE will be regularised there by ending his/her probation period. Eligibility Criteria: Interested Candidates who wish to apply for 8500 Assistant vacancies in the SBI must posses the below mentioned eligibility criteria. Age Limit (As on 01.12.2011): Min Age: 18 years and Max: 28 years. Have the ability to write and speak English Language fluently. Have the Knowledge of Local Language. Application Fees: An application fee of Rs 350 (For Gen and OBC Candidates) and Rs 50 (For Others) will have to be deposited either by Online Mode Or By Offline mode in any Branch of State bank of India before the last date. Procedure for Applying: Interested candidates who meet the above mentioned eligibility criteria can send their Applications Online by using the below mentioned procedure. (I) Payment of Fees (Offline): Candidates who wish to apply with Offline Fee Payment method must fill their Online Application at www.statebankofindia.com. Candidates must carefully fill the Online Application form by following the On-Screen Instruction.After submitting the Online Application form, the system will generate a Fee Payment Challan.This Fee Payment must be printed and used for Payment of Application fee in the State bank of India.After the Payment of Application fees, the registration process is completed. Details: Candidates applying for the post of Assistants in State Bank of India must read the Detailed Advt, from the Link given below.